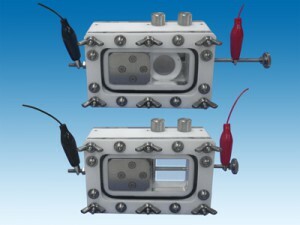 To slide the electrode holders makes it possible to observe the phenomenon may occure inside of the battery without disassembling the cell in order to apply the quartz glass view port. It contributes to monitor the generating process of the lithium dendrite which may cause the short circuit of batteries. 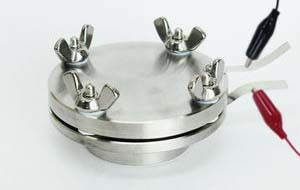 *Superior version of the two electrodes flat cell. 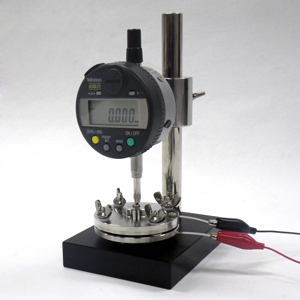 To add internal reference electrode, it is able to measure cathode and anode electrical potention individually. The cathode and anode data becomes more reliable. The phenomenon can be learnt by experience in the battery. 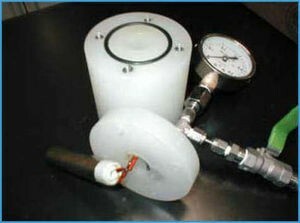 To measure the amount of the gas generated when it overcharges and overdischarges from inner pressure. The elements of gas is analyzed by exhaust. 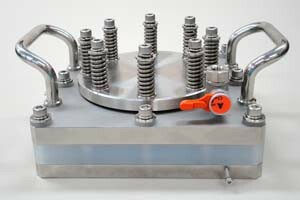 Cell for electrode thickness changes consists of an electrode expansion gauge (main body/2E-CELL-ETC) mounted on the floor frame and a support for the digital gauge which measures the variation. 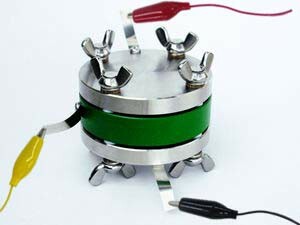 The battery elements stopper (plug) comes out of the cell. (It maintains the air-tight condition by O-rings). 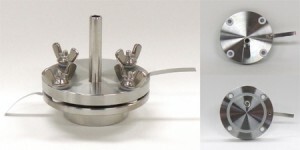 In case the electrodes expand or shrink, the stopper goes up and down vertically, which pushes the digital gauge to indicate the changes in the thickness of the electrodes during the reaction. Thereby, thickness displacement and the maximum rate of expansion of the electrode at the time of charge and discharge can be measured. The cell measures the electrical conductivity of the liquid and the gel. 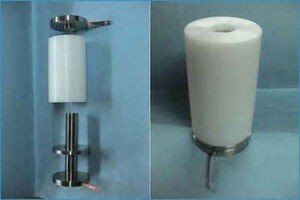 It can be specified the sizes and the materials and the electrodes distance. The cell measures the electrical conductivity of the powder while pressing the powder mixed with active materials and conductive materials. 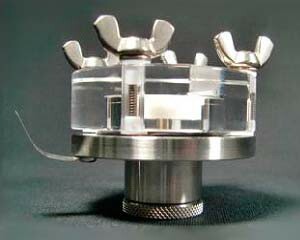 It is impossible to measure the gas with a small electrode size. Thus, the cell is developed to measure it with cylindrical electrodes. 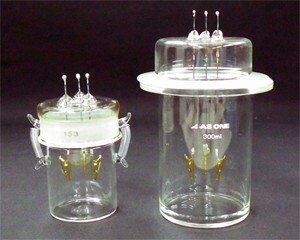 It is the three electrode beaker cell. 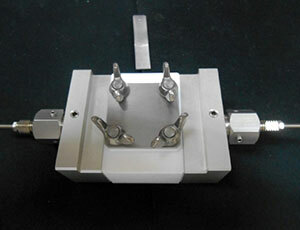 We design and manufacture according to electrode size or a test method.